The Hillsboro Lady Indians Tennis team poses for a team photo at the Tennis courts on the campus of Hillsboro High School. 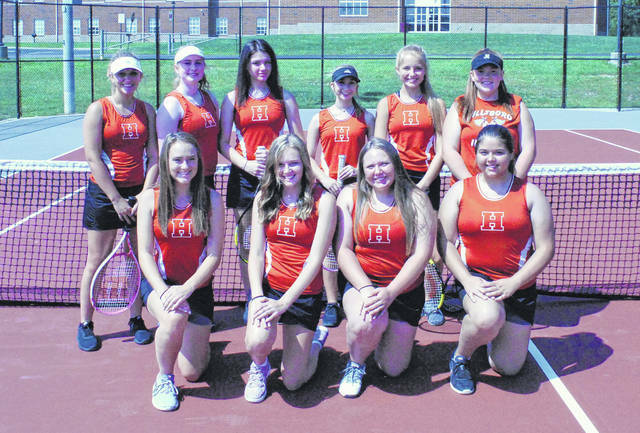 The Lady Indians varsity Tennis team will be looking to build on a foundation of young talent in the 2018 season. Hillsboro Head Coach LaRue Turner pointed to the youth on the team as an unknown for the squad this year. “We have a very young team. Probably the youngest we have had in years. All of our singles players are first year players and first year varsity players. I don’t know what to expect. But, it’s a great way for them to get some experience and we will just have to fight our way through this season and see what happens,” said Turner. The Lady Indians have three seniors on the 2018 squad and Turner has placed them in doubles and expects them to lead the team from that position this year. “I expect the doubles teams to prop up the rest since we don’t have that experience. But, I am looking at in another couple of weeks or so after the girls get some experience, maybe starting the end of August or first part of September. The girls will start understanding their roles and what they have to do to get prepared and I look for things to turn around a little bit,” Turner said. Turner expects the girls to improve their serve percentage before they move on to other things in 2018. “I’m looking for them to increase their percentage of serves that are good and to start putting some pace on those serves. Right now we are just getting the balls over and if you can’t serve you can’t start the game. So that is one thing that I want to see improvement on,” said Turner. After the ladies of Hillsboro have taken that crucial first step Turner expects to be able to move onto other things. “The next thing is ground strokes and being consistent in the ground strokes,” Turner said. Turner also took the time to invite the community to come out and support the girls this fall. “Please come out, we have one of the greatest facilities here, certainly in our league we have the best. It’s just beautiful out here and later on since we have lights we will get in late afternoon games in late September where you can come out and enjoy Tennis under the lights,” Turner told The Times-Gazette. https://www.timesgazette.com/wp-content/uploads/sites/33/2018/08/web1_Hillsboro-Girls-Tennis.jpgThe Hillsboro Lady Indians Tennis team poses for a team photo at the Tennis courts on the campus of Hillsboro High School.